Amanda Palmer Demonstrating the Art of Giving, September 2012. Amanda Palmer (Web|Twitter) is a musician and writer. She is one-half of the “Brechtian punk cabaret” group The Dresden Dolls and the frontwoman of Amanda Palmer & The Grand Theft Orchestra. Recently she published a book titled The Art of Asking: How I Learned to Stop Worrying and Let People Help (2014) based on her popular TED Talk on the same subject. Even if some of her ideas are tone deaf there’s no denying she’s an immensely talented artist (her album Theater is Evil is brilliant and rarely leaves my CD player). Palmer passed through Houston the other night (two years ago), which was my first introduction to both her and her work. Drunk and amazed, the only trouble I had was trying to make small-talk with the fans who only wanted to talk about Neil Gaiman. 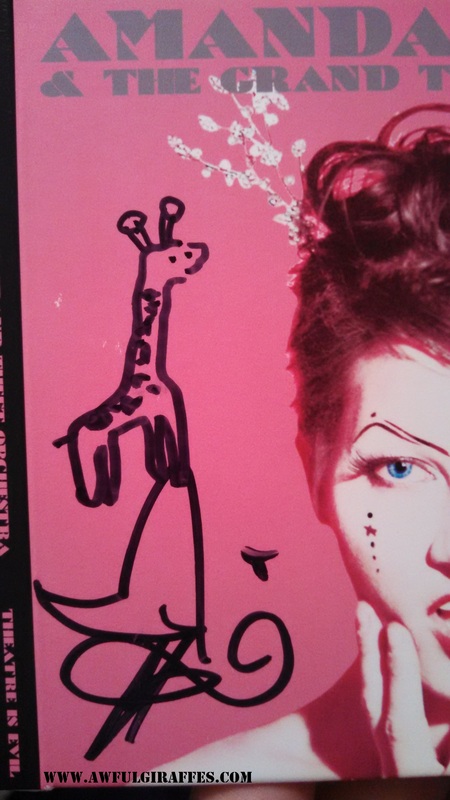 Still, everyone was a friendly bunch — and when I asked Palmer to draw a giraffe she did so with only modest hesitation (the guitarist — whose name I’m excluding here on principle — thought I was a joke). This is the gold-standard of Brechtian Punk Cabaret giraffes (?). This entry was posted in Musician, Producer, Writer and tagged 2012, Amanda Palmer, author, bad art, Brechtian Punk Cabaret, drawing, giraffe, giraffes, Grand Theft Orchestra, houston, illustration, Kickstarter, music, musician, Neil Gaiman, punk cabaret, singer, Texas, The Art of Asking, The Dresden Dolls, Theater is Evil, tour, writer on December 9, 2014 by Joshua Preston.